Oh My Gosh-A-Wa! Goldfinger Law serves Oshawa! Even worse is that the Oh My Gosh-A-Way was nominated to be an official slogan for the City of Oshawa. Can you believe that! Oshawa has a population of around 153,000. It sits 61km east of Toronto and is recognized as the Eastern Boundary of the Golden Horseshoe Area. Oshawa sits in Durham Region and is the largest City in the Region. Canada’s most famous race horse, Northern Dancer was born in Oshawa. Thought I’d get into that before I started talking about Oshawa’s auto sector, which can be depressing. The headquarters of General Motors Canada is located in Oshawa. GM used to be, and remains a big part of Oshawa’s economy. As GM goes, so does Oshawa. Despite serious cutbacks to production, GM continues to be Oshawa’s largest employer. But that doesn’t say much because so many people have lost their jobs with GM in Oshawa that the City’s unemployment rate has skyrocketed. Still, Oshawa as a City and Metropolitan area continues to grow. This is in large part due to the affordable housing prices, quality of life, and its close proximity to Toronto. Many people from Oshawa take the GO Train in to Toronto for work, and then commute back to Oshawa, Clarington, Whitby or the surrounding Durham area to come home. The affordability of the homes just can’t be beat. Oshawa has always had a strong union and left wing presence given its strong connection to General Motors and the labour movement. But that has swung in recent years as the riding has elected a string of right wing conservative MPs to the House of Commons. There has to be some good explanation for this, but I don’t know what it is. Oshawa is the home of the newly built GM Place which sits on Aethol Rd in Oshawa. It also is the home of a brand new Court House on Bond Street which is modeled after the Court House in Brampton. The personal injury lawyers of Goldfinger Law attend at the Court House in Oshawa frequently to argue car accident cases and speak to various personal injury matters on behalf of our Oshawa and Durham Region clients. Car accident victims for Oshawa and Durham Regional are taken to the Lakeridge Health Centre; wish used to be named the Oshawa General Hospital. The Oshawa Generals of the OHL and the Oshawa Power of the Canadian Basketball League call Oshawa home. Number 4 Bobby Orr also played his junior hockey in Oshawa. Pretty impressive! 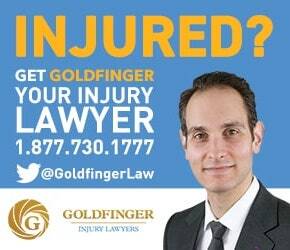 Goldfinger Law would be pleased to assist you or your loved ones with their accident, injury or insurance claim in and around the Oshawa and Durham County area. You can visit us at our Toronto or Peterborough Offices. Or, we can come visit you at your home or in hospital. Whatever works best for you given your injuries. You can reach us toll free at 1-877-730-1777 or by email at info@goldfingerlaw.com. We would be pleased to assist you with your Oshawa personal injury claim any way that we can.